LONDON, England -- Cynthia Lennon, the first wife of former Beatles guitarist John Lennon, died of cancer Wednesday at her home in Spain. She was 75. Her death was announced on the website and Twitter account of her son, Julian Lennon and confirmed by his representative. Julian Lennon posted a moving video tribute to his late mother with a song he had written in her honor. "You gave your life for me, you gave your life for love," it begins, showing footage of him as a young boy with his parents. 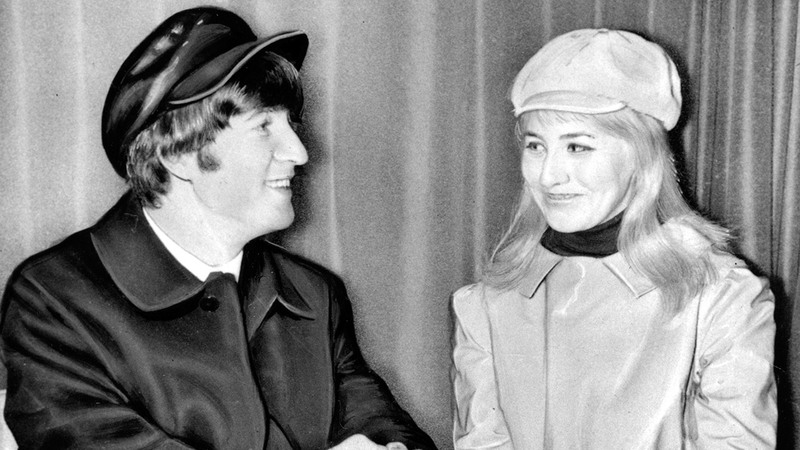 It also shows footage of Cynthia with John during the early days of Beatlemania. "The love you left behind will carry on," Julian, 51, sings in a style influenced by his late father. It concludes with the words: "I know you're safe above." A statement from Julian's representative said Cynthia died at her home in Mallorca "following a short but brave battle with cancer." It said Julian was at his mother's bedside throughout. Cynthia and John Lennon met at art school in Liverpool in 1957 and married shortly before the Beatles shot to worldwide fame. Julian was their only child together. The divorce prompted Paul McCartney to pen the Beatles' classic "Hey Jude" to help Julian cope with his parents' separation. He changed the name Julian to Jude in the song. The line "Take a sad song and make it better," is about the Lennons' broken marriage and its impact on their son. Author Hunter Davies, who wrote the only authorized Beatles biography in 1968, described Cynthia as a "lovely woman" who was ill-treated by her famous husband. He said she wasn't at all like her husband, but was "quiet and reserved and calm" and "not a hippy at all." In her autobiography, Cynthia described John as jealous and insecure. She said he hit her once after she danced with Stu Sutcliffe, then a member of the band. But in a 2005 interview with "Good Morning America" she recalled his charisma as well. "You couldn't resist being around him," she said. "You couldn't resist watching what he was up to. I mean, he was a total rebel. Everybody was amazed by him."